If you had visions of Seal Team Six swooping into Wolfsburg underneath radar cover by helicopter in the middle of the night, breaching the door of a mansion, putting a black bag over the head of now-indicted former Volkswagen CEO Martin Winterkorn and absconding with him back to America before the German Air Force has a chance to scramble its jets, I have two things to say: one, that you must be really pissed about your VW diesel recall because that is an oddly specific and vengeful fantasy, and two, that is probably not happening. Winterkorn was charged with conspiracy and wire fraud in a federal indictment unsealed in Detroit yesterday relating to VW’s now infamous diesel cheating scandal. While eight others have been indicted and two German engineers were sent to prison, Winterkorn is by far the most high-profile person charged criminally in the affair. The indictment describes a July 27, 2015, meeting at which VW employees presented PowerPoint slides to Winterkorn and “other senior VW management at an in-person meeting at VW’s headquarters in Wolfsburg.” The meeting provided a “clear picture” of how the company was deceiving U.S. regulators about software used to rig emissions tests of Volkswagen diesel vehicles, it said. Of course he knew! They always do! 2nd Gear: I Thought He Liked Boring? After much criticism following a bizarre Q1 earnings call this week in which he called analysts’ questions “boring” and turned to YouTubers for them instead, Tesla CEO Elon Musk defended his actions on Twitter, the go-to place for attempting to explain yourself after you did something weird and/or egregious. Tesla shares had their biggest drop in more than a month on Thursday after the earnings call, during which the CEO rejected analysts’ questions following another quarter in which the company burned more than $1 billion in cash and pushed back production of its Model Y crossover. Musk said the questions “are so dry,” and turned instead to one from a channel on the YouTube video-streaming service. Sorry the business isn’t just rocket ships and hanging out with movie stars, Elon! [...] Tesla stock was little changed after the earnings announcement but fell during a conference call, when Musk began cutting analysts’ questions short, costing Tesla over $2 billion in market capitalization. Don’t you hate when that happens to you? BMW AG posted a 3 percent drop in first-quarter operating profit as unfavorable exchange rate effects weighed on revenues and earnings, even as the automaker posted higher margins and sales volume at its cars business. Luckily the M5 Competition Package should help make up the difference. The Detroit News has a briefing on what’s going on at General Motors’ Orion Township plant in metro Detroit, which was idled during the bankruptcy a decade ago and now builds the electric (and soon autonomous) Chevrolet Bolt. It’s also one of the only American car plants left that builds small cars. [...] Efficiency will be important while GM waits to see where demand for EVs in the U.S. goes, Dziczek said, but it’s not something GM or its legacy automotive competitors are unaccustomed to. Building cars is hard, I’m told. 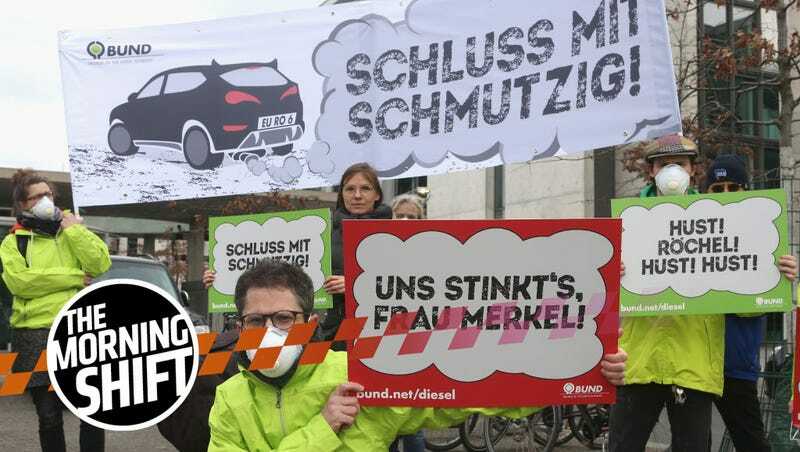 Neutral: Did VW Get Punished Adequately? The company seems on the right track these days. Its crossovers are leading a bit of a sales comeback in the U.S. and it’s making penance by investing heavily in EVs—not to mention the hefty fines it had to pay. But is it enough, and should more execs go to jail? I&apos;m Only 18 And I Already Have Two Unreliable Rides! What Car Should I Buy?